We appreciate your feedback about your support experience with SkyVerge, developers of Local Pickup Plus. This helps us maintain high standards on the WooMarketplace, and helps SkyVerge improve. The built-in “Local Pickup” shipping method for WooCommerce allows your customers to come to you to pick up their purchased products. While this works great for stores with a single brick-and-mortar location, it poses large issues for stores with multiple locations or distribution centers. Using Local Pickup Plus, your customers know exactly where to go to pick up their products, and you know where to expect them. Customers will see a list of available pickup locations for each product that can be picked up (or you can opt to only allow one pickup location per order), and can choose locations that that let them receive orders where they want them. Each pickup location can have its own settings for holidays, business hours, and more. However, there maybe greater differences between your locations, too, such as the stock each carries. If certain locations only carry certain products, you can limit which products are available for pickup at a given location. If a product is in the cart that’s not available at a location, that location is simply hidden from the list when the customer chooses where to pick up the item. Note that you must allow pickup on a per-item basis to use this setting. Shipping large or hazardous items can be a huge pain for merchants, so you may want to require pickup for these items. 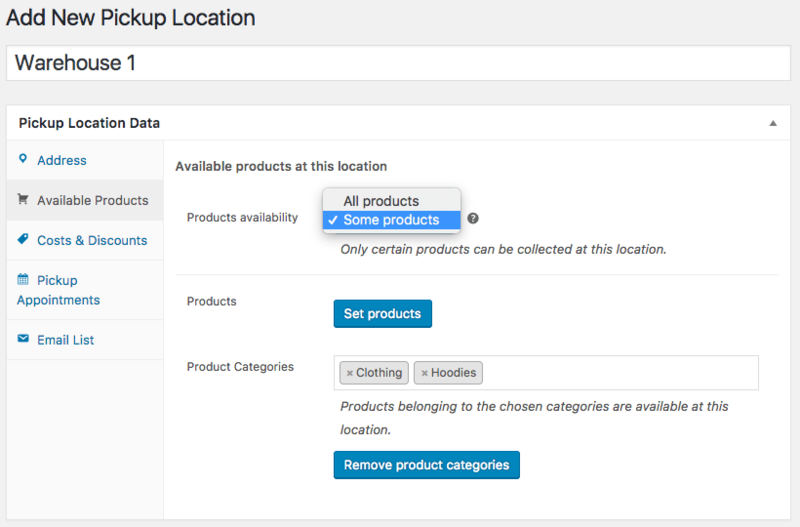 With new selectors for product and category pickup availability, you can designate a product as requiring pickup, or a product that cannot be picked up (must be shipped). Sometimes you’ll need to know when a customer is coming to get an order, or to inform them of when your location accepts pickups. 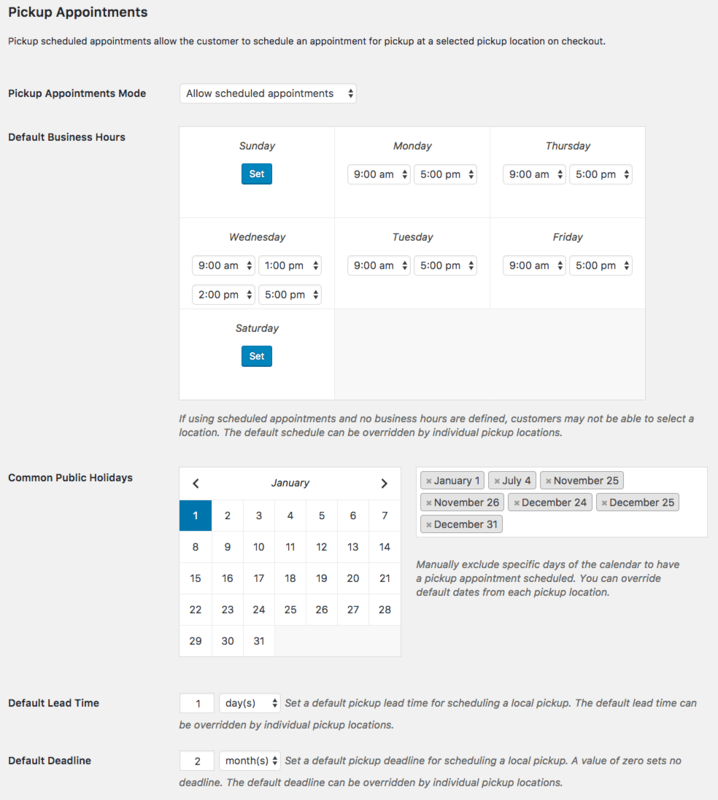 Pickup Appointments allow you to set up business hours globally or on a per-location basis, along with holidays, lead time (prep time needed for a pickup), and deadline (maximum days allowed to schedule a pickup). Each location can even implement its own schedule, lead time, and deadline if the default doesn’t fit. 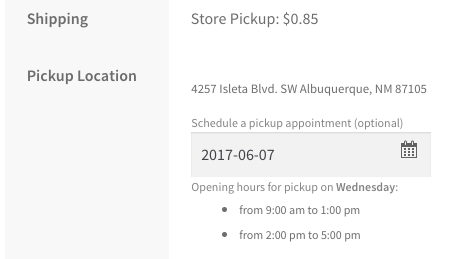 If appointments for pickup date are enabled, the customer will be able to choose a date (or will be required to pick one, depending on your settings), and will see the location details and operating hours on the date they choose. 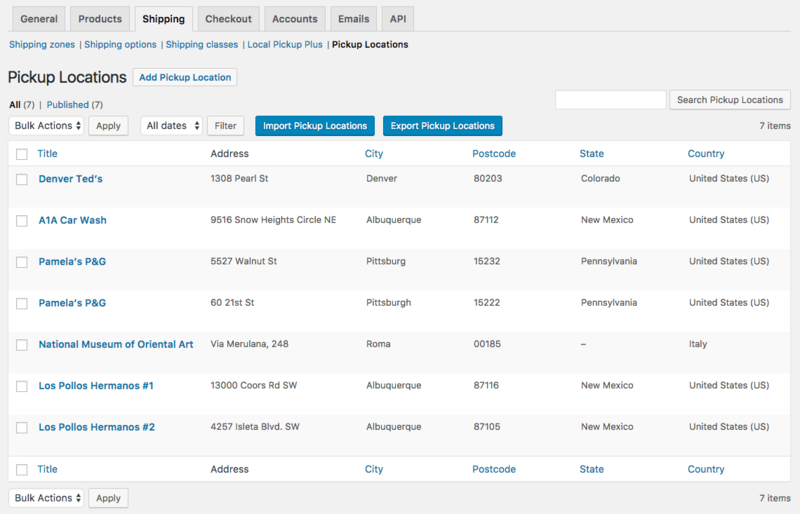 When a pickup location is set up, you can add an email notification list for the location. Any time an order contains items from this location, these email addresses will be added as recipients for admin order emails. That’s it! Your customers will now be able to pick up their order and you’ll know where to expect them!